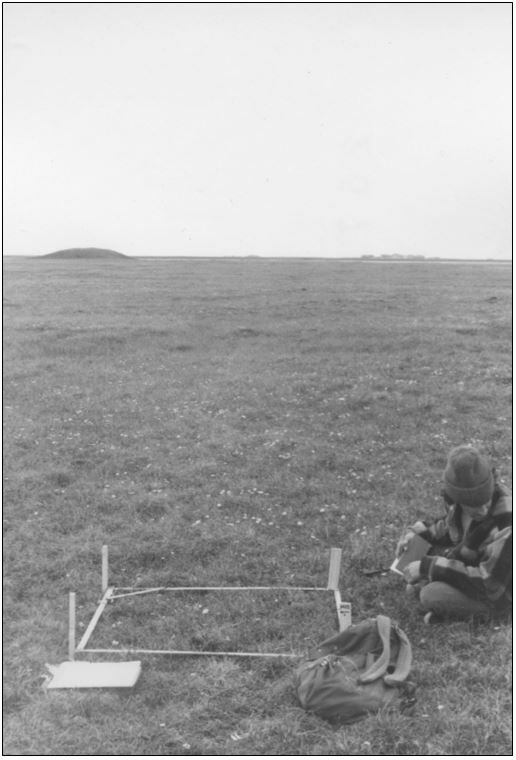 This dataset provides environmental, soil, and vegetation data collected between 1973 and 1980 from 89 study plots in the Prudhoe Bay region of Alaska. Data includes the baseline plot information for vegetation, soils, and site factors for study plots subjectively located in 43 plant communities and 4 broad habitat types across the glaciated landscape. Specific attributes include: dominant vegetation, species, and cover; soil chemistry, physical characteristics, moisture, and organic matter. This product brings together for easy reference all the available information collected from the plots that has been used for classification, mapping, and analysis of geobotanical factors in the Prudhoe Bay region and across Alaska. This dataset includes three data files in *.csv format and three companion files in *.pdf format. Prudhoe_Bay_Environmental_Data.csv Comprehensive set of environmental characterization data for Prudhoe Bay research plots including the descriptive site factors. NOTE: Coded and scalar variables are followed by a description column (e.g. LOCATION and LOCATION_DESC). See legend companion file for complete list of coded and scalar variables and their descriptions. 4 to 92 DATASET_PLOT_NUMBER Column headings are all 117 plot numbers. The data values are Species Cover Classes (Braun-Blanquet cover-abundance scale): where r (rare), + (common, but less than 1 percent cover), 1 (1-5 percent), 2 (6 to 25 percent), 3 (25 to 50 percent), 4 (51 to 75 percent), 5 (76 to 100 percent). 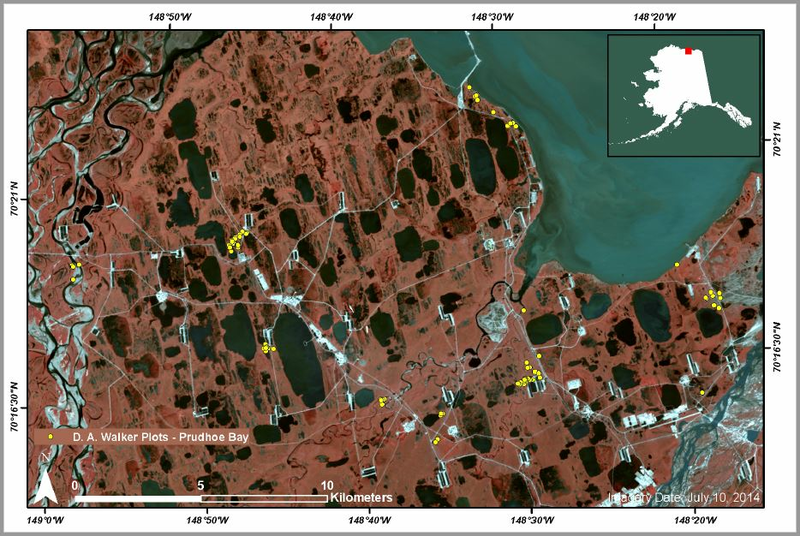 This dataset is important because these data were recorded 5 years after the discovery of the Prudhoe Bay Oilfield and this data includes baseline vegetation and environmental data of the Prudhoe Bay Oil Field. The vegetation of the Prudhoe Bay area was described and mapped by D. A. Walker for doctoral thesis at the University of Colorado, Department of Environmental, Population and Organismic Biology (Walker 1981). The study was initiated in 1973 under the U.S. Tundra Biome portion of the International Biological Program (IBP) and is part of U.S. Army Corps of Engineers, Cold Regions Research and Engineering Laboratory (CRREL) research activities. A map of the plots is depicted in Figure 2. Plots were permanently marked in a corner of the first square meter of the 1x10-m plots, and in a corner of the 1-m2 plots. Species and environmental data (including soil physical variables, subjective site assessments, and active layer depths) were collected in the field and soil samples were brought back to the lab for the chemical assessments. Approximate GPS coordinates were obtained for all but 2 plots by the author in 2013 utilizing aerial photographs of the study area in conjunction with Google Earth. Figure 2. Aerial photograph of Prudhoe Bay region of Alaska with study plots marked in yellow. The source of these data is the Prudhoe Bay CRREL report 85-14 (Walker 1985). Species cover classes are by percent. Both the author's determination and the current taxonomy according to the Panarctic Species List (PASL) are listed. Taxa are listed in alphabetical order according to the accepted PASL name. In one instance, taxa were lumped into a single taxon in the PASL: Ochrolechia frigida (Ochrolechia frigida and Ochrolechia frigida thelephoroides). The source of these data is the Prudhoe Bay CRREL report 85-14 (Walker 1985). The plot numbers in the source data are the author's. The main plot numbers in the Turboveg database are accession numbers and will differ. The author's plot numbers are retained in the FIELD_RELEVE_NUMBER field in the Turboveg database. Observations of soil moisture and pH, percentage of organic matter, soil nutrients, snow depth, hummock size, cryoturbation and animal activity were recorded for each of the plots. These are the physical and chemical characteristics of the soils for the Prudhoe Bay vegetation plots from the CRREL report 85-14 (Walker 1985). Soil terminology is according to Soil Survey Staff Manual (1974; USDA). Walker, D. A. 1981. The vegetation and environmental gradients of the Prudhoe Bay region, Alaska. Dissertation. University of Colorado, Boulder, CO, USA. Walker, D. A. 1985. The vegetation and environmental gradients of the Prudhoe Bay region. CRREL Report No. 85-14. U.S. Army Cold Regions Research and Engineering Laboratory, Hanover, New Hampshire, USA.